The star known as Gliese 581 is utterly unremarkable in just about every way you can imagine. It's a red dwarf, the most common type of star in the Milky Way, weighing in at about a third of the mass of the sun. At 20 light years or so away, it's relatively nearby, but not close enough to set any records (it's the 117th closest star to Earth, for what that's worth). You can't even see it without a telescope, so while it lies in the direction of Libra, it isn't one of the shining dots you'd connect to form the constellation. It's no wonder that the star's name lacks even a whiff of mystery or romance. But Gliese 581 does have one distinction  and that's enough to make it the focus of intense scientific attention. At last count, astronomers had identified more than 400 planets orbiting stars beyond the sun, and Gliese 581 was host to no fewer than four of them  the most populous solar system we know of, aside from our own. That alone would make the star intriguing. But on Wednesday, a team of astronomers announced that it had found two more planets circling the star, bringing the total to six. And one of them, assigned the name Gliese 581g, may be of truly historic significance. For one thing, the planet is only about three or four times as massive as our home world, meaning it probably has a solid surface just like Earth. Much more important, it sits smack in the middle of the so-called habitable zone, orbiting at just the right distance from the star to let water remain liquid rather than freezing solid or boiling away. As far as we know, that's a minimum requirement for the presence of life. For thousands of years, philosophers and scientists have wondered whether other Earths existed out in the cosmos. And since the first, very un-Earthlike extrasolar planet was discovered in 1995, astronomers have been inching closer to answering that question. Now they've evidently succeeded (although to be clear, there's no way at this point to determine whether there is life on the new planet). "We're pretty excited about it," admits Steve Vogt of the University of California at Santa Cruz, a member of the team, in a masterpiece of understatement. "I think this is what everyone's been after for the past 15 years." Planetary scientist James Kasting of Penn State University, who wasn't involved with the discovery, agrees. "I think they've scooped the Kepler people," he says, referring to the telescope that launched into space early last year on a mission to determine how common Earthlike planets might be. 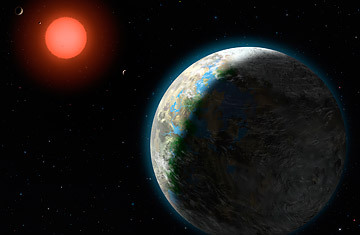 The "Kepler people" have a number of candidate Earths in the can but are still working to confirm them. Being first isn't the main reason Vogt is excited, however. "Someone had to be first," he says. "But this is right next door to us. That's the big result." What's particularly big about it is a matter of simple arithmetic. With only 116 stars closer to Earth than this one, it was hardly a sure thing that so small a sample group would produce two habitable planets, including Earth. And two such planets may be an undercount, Vogt says, since just nine out of those 100-plus stars have been studied in any detail. Indeed, one of Gliese 581g's sister planets, known as Gliese 581d (O.K., they don't put a lot of creative energy into naming these things), could conceivably be a habitable world itself. One of the four planets known to orbit Gliese 581 before the latest discovery, 581d was found by a team of Swiss astronomers in 2007 and was thought to be outside the habitable zone and thus too cold for liquid water. But a reanalysis last year brought it into the zone, albeit just barely. The problem is, 581d is too big to be Earthlike; it's probably made mostly of nonwater ice, like Neptune and Uranus, which makes a poorer candidate for life than 581g. Lost in the excitement over possible life on the new world is what a remarkable achievement its mere discovery was. Detecting a planet this small is monstrously hard  and would have been impossible when Vogt and co-discoverer Paul Butler of the Carnegie Institution of Washington first got into the planet-hunting game in the early 1990s. The instruments you use to detect tiny back-and-forth motions in the star  motions caused by the orbiting planet's gravitational tugs, which are often the only way to infer that the worlds exist at all  simply weren't sensitive enough. Since then, says Vogt, "I've been busting my gut to improve the instruments, and Paul has been busting his gut to do the observations." In all, those observations span more than 200 nights on the giant Keck I telescope in Hawaii over 11 years, supplemented by observations from the Geneva group  and that painstaking work finally confirmed 581g's existence. None of this proves that there is water on Gliese 581g. "Those are things we just have to speculate about," says Vogt. But he goes on to point out that there's water pretty much everywhere else you look. "There's water on Earth," he says, "and on the moon, and Mars, and on Jupiter's moon Europa and Saturn's moon Enceladus, and in interstellar space. There's enough water produced in the Orion Nebula every 24 seconds to fill the Earth's oceans." It's not hard to imagine, in other words, that Gliese 581g might have plenty of water as well. "It could have quite a good ocean," Vogt says. Certainly, it could be a sterile, nonbiological ocean. But unlike any planet found until now, there's nothing to rule out the idea that it could be teeming with life.